When Green Lantern was included in the large slate of DC Comics-based movies running through 2020, little was known about it except that it was a possible reboot of the 2011 flop that starred Ryan Reynolds. At the San Diego Comic-Con on Saturday during Warner Bros Pictures panel in Hall H, that same slate now included the title of Green Lantern Corps. The feature will now include more than one Green Lantern meaning we could see Hal Jordan, John Stewart, Guy Gardener, and possibly dozens of other intergalactic protectors that make up the Green Lantern Corps. This had been rumored and it seems like the right approach to involve the team of Lanterns. Green Lanterns have a rich comic book history with so many interesting characters that it would take a feature film to do it justice. The scenes in that failed 2011 film that worked best was Hal's training with the Corps but sadly their stay in space was all too brief. Now Warner Bros can mine that property for an epic space adventure. How it ties into the rest of the DC films is unknown as the movie is scheduled to be released June 19, 2020, after both Justice League movies. Which Green Lantern will be part of those films? Hal Jordan presumably but could include others. It's still early as we won't see the first JL film until 2017. As far as acting choices, rumors continue to involve Chris Pine (Star Trek) taking the Jordan role and Tyrese (Fast and Furious) has been notoriously publicly campaigning for Stewart. While casting decisions were not mentioned at Comic-Con they could come later this year. 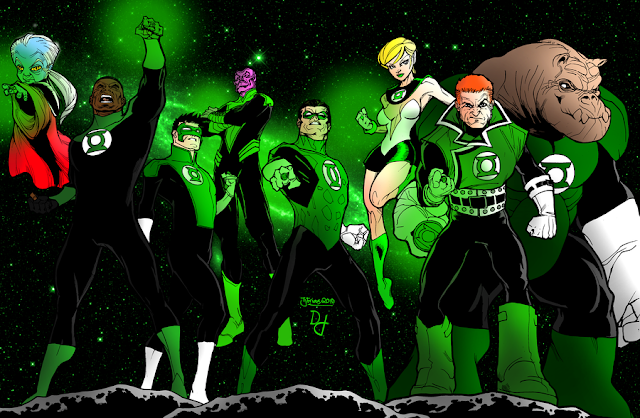 Are you excited for another attempt at a Green Lantern movie involving the Green Lantern Corps? DC Comics Green Lantern Green Lantern Corps Hal Jordan John Stewart movie Warner Bros.
Labels: DC Comics Green Lantern Green Lantern Corps Hal Jordan John Stewart movie Warner Bros.